Valentine’s Day is soon (read: two weeks! ), so now’s as good a time as any to start thinking about your V-Day plans. Maybe you’ve got romantic plans out, or maybe you’re having a sweet night in, but we know there should be one thing involved: chocolate. 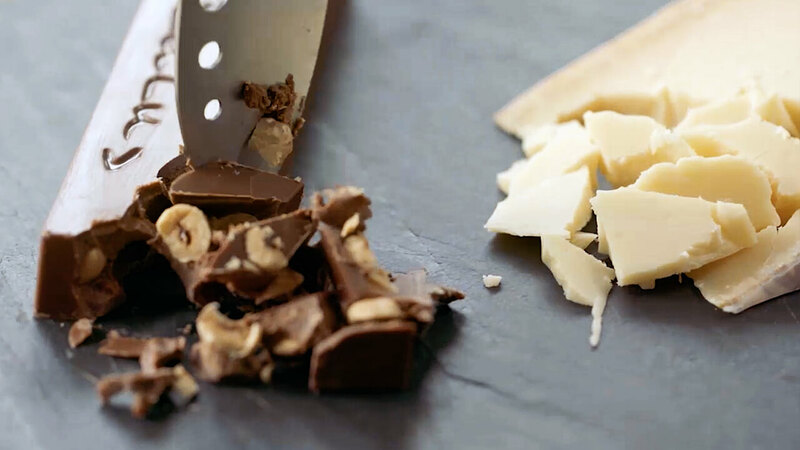 Being cheesy experts ourselves, we think cheese goes with everything, and chocolate is no exception. While you might not think these sweet and savory delights go together, we’re here to prove you wrong. Something about this decadent, aged Gouda just begs for something sweet. Its notes of caramel and sweet-salty butterscotch usually are paired with a nice glass of scotch and whiskey, but if you’re looking to add a little sweetness, the Raaka Bourbon Cask bar is the way to go. The dark virgin chocolate is enhanced with the flavors of aged bourbon, with bright notes of spicy rye, vanilla, and caramel. Since we know like goes with like, these two were just meant to be. Summer pasture fed cow’s milk, with hints of floral, fruity flavors, Pleasant Ridge Reserve has those bites of sweetness we love. Like the Alpine cheeses it is inspired by, it goes great with a dark chocolate. We love it with the dark chocolate Infernal bar from Pralus Chocolatier, where the chocolate is fruity and deep and filled with toasty hazelnuts. We’re talking a match made in heaven, if we’re being honest – and it sure is heavenly. Sultry smokiness paired with roasty coffee – honestly, what can be better? With a ball of fresh goat’s milk cheese wrapped in maple leaves and then smoked, there’s a deep, campfire-y richness and clean minerality that reminds us of smelling cooking bacon in the morning, but sweet. Add your cup of coffee or make it a mocha with the chocolate bar from Mast blended with freshly roasted coffee beans, and this is exactly what you’ve been looking for. Our taste buds have heart eyes. Previous PostPrevious Make Whey For… Murray’s Camembert!